Nguyen Van Binh who found the shipwreck in the Lam River (photo by Mark Staniforth courtesy of the Bach Dang River and Van Don Research Team). 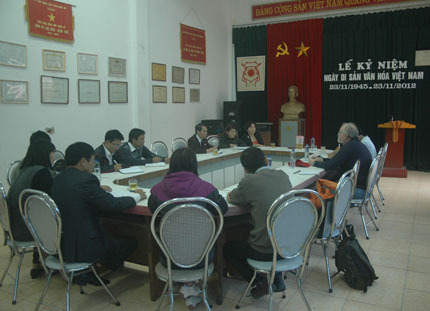 The Nghe An project was initiated as a result of an invitation to the Institute of Archaeology in Hanoi from the Service of Culture, Sport and Tourism for the Nghe An province and the Nghe An province museum. Dr Le Thi Lien and Pham Thanh Son from the Institute of Archaeology (IA) in Hanoi together with Jun Kimura and Mark Staniforth travelled to Nghe An province from Sunday 2 Dec 2012 to Tuesday 4 Dec 2012 to investigate a shipwreck located in the Lam River. Mr Nguyen Van Binh who is a 46 year-old salvage diver located this shipwreck about 15 years ago (1997?) 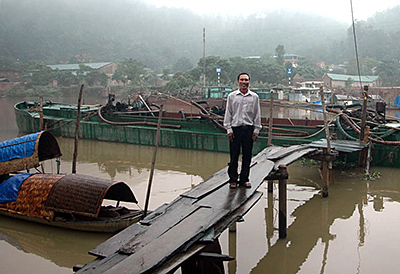 in the Lam River south of Vinh city in Nghe An province. He described the shipwreck as consisting of an all wooden structure that was 30 to 40 meters long and 10 m wide standing 0.5 m out of the seabed (consisting of sand and silt) in 13 to 15 m of zero-visibility water. He saw what may have been part of the rudder and recently (four months ago) he raised two cannons, which are now held in the Nghe An province museum. The Nghe An province museum is located in Vinh city and the new building was completed in 2005. The Director is Mr. Hoang Huy Truyen, the Vice-Director is Mr Nguyen Due Kiem and it has 22 staff members. It has more than 20,000 artefactswhich are in storage as the museum currently has no permanent exhibitions. In recent years the Service of Culture, Sport and Tourism for the Nghe An province has protected the shipwreck by means of a “protected zone”.